This week, all across America, family and friends will join together to celebrate one of the most beloved holidays: Thanksgiving. And how do we celebrate our thankfulness? We cook up a glorious feast, of course! With Turkey Day – ahem – I mean Thanksgiving Day just around the corner, it’s time to make room for one thing that I know we can all be thankful for… leftovers! 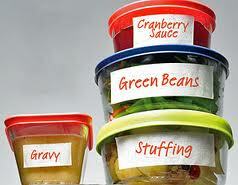 That’s right, it’s time to clean out your fridge and make room for a whole bunch of tupperware! Sadly, Americans waste roughly 14 percent of their food purchases. All too often, food items get buried and forgotten about, particularly in refrigerators. My challenge to you this week is to spend a few minutes taking inventory of all your food items in your fridge. Is there anything old and outdated that needs to be tossed? Anything moldy, gross, and growing legs? Maybe you have a few items that are close to expiration; commit to incorporating these things into your meals over the next few days. Now, if you are having a hard time figuring out if that jar of pickles, container of cottage cheese, or left-over lasagna is edible, try looking it up on shelflifeadvice.com. This site, created by a retired college professor, is the ultimate food manual. Not only does it list the shelf life of ingredients (based on the input of food scientists and government agencies), but it also provides up-to-date food recall information and storage tips to maximize freshness. QUICK TIP: Crumple up a piece of brown paper bag into a ball and place it alongside fruits and veggies in the crisper for ordor protection… it works wonders at removing smells! So, good luck on your refrigerator overhaul… and Happy Thanksgiving from my family to yours!